Infinity Runner is an endless runner played from a first-person perspective. Throwin' A Hot Dog Down A Hallway..
A naked dude running down hallway after hallway. That pretty much sums up Infinity Runner. In between being naked and running, you use quick time events to give a few guards the smack down or you turn into a werewolf after some kind of brain aneurysm and run down another hallway. There isn't much variation to the gameplay or the environments. The game features 14 levels and two game modes, story and arcade. Story mode has 7 areas with 2 levels in each, and 3 difficulties to complete, easy, normal & hard. A playthrough of the story can be completed in 2 - 3 hours. Arcade mode uses the same 7 areas as story mode and has 4 sub-modes. Infinity, Time, Score and Distance. As for the story of the game, the premise on the Xbox store makes it sound awesome, but is that what you get when you play it? "The Infinity is the largest spaceship ever built by man-kind; flung into the void of space to secure humanity a new home amongst the stars. However, instead of discovering paradise, the inhabitants of The Infinity unlocked the door to a long forgotten nightmare. 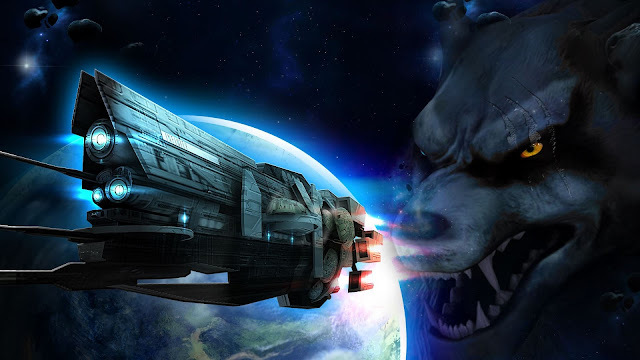 Deep inside this leviathan something terrible hunts, out of myth and legend the last werewolf stalks the ship. Infinity Runner centers on a prisoner desperately trying to escape the decaying ship and the clutches of the terror within." Nope. At least that's not what I came away with anyway. What I came away with was much more simple than that. You are a prisoner on a space station and you are awakened by some lady and you are told to start running and the whole point of the game is to escape the station. I didn't hear anything about looking for a new home or some forgotten nightmare but maybe I just wasn't listening. If that is the case, I'd still say the premise was poorly executed because the description on the store kept my attention longer than the in-game story. The gameplay in Infinity Runner is fairly simple. Being an endless runner, the character auto runs. All the player has to worry about is sliding under, jumping over & dodging obstacles, and turning corners. There are also quite a few quick time events in between. Besides the game just having too many of them, one the things I found annoying about the QTEs are the icons that come up for the bumpers. They look nothing like the bumpers on the Xbox One controller. They are grey and look more like Xbox 360 bumpers than anything. I could just be nitpicking but if you're like me, you look at the color or the shape, for the bumpers and triggers, of the icon that comes up to avoid failing because you took an extra second to read which button to push. I will say that this only really causes a problem during the final fight of the game though. The biggest problem with the gameplay is the controls aren't very intuitive. There were countless times when I jumped to grab a zipline or to wallrun and just fell to my death or had the right stick pointing towards the direction I was suppose to turn and ran into a wall. I thought it might just be that I sucked at the game, but then I heard one of the contributors on the site, Rand al Thor 19, complaining about the same things during his live stream. You can check out footage from his live stream below. WARNING: I would mute this #$*% if you don't like cussing, there are quite a few expletives thrown around. If you'd like to watch of one of our daily live streams, you can do so at Twitch.tv/drm_gamecast. If you like endless runners, you might want to give Infinity Runner a try. If you like good games, buy something else. What I played: 4 hours completing the story and obtaining 42 of 55 achievements. 1 hour of arcade mode.